Distribution: Dugongs are related to manatees and can be found in warm coastal waters from East Africa to Australia, including the Red Sea, Indian Ocean, and Pacific. In these areas they habitat on coral Reefs, in estuaries and in seagrass beds. Description: A dugong is roughly the size and shape of a large dolphin, but with a less streamlined head and no dorsal fin. The muzzle is largeand fleshy; the eyes are small; the external ears consist only of tiny openings; and the nostrils lie close together at the anterodorsal tip of the snout. 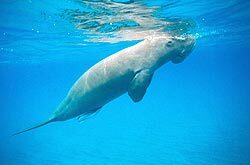 The Dugong (Dugong dugon) is the smallest member of the order of Sirenia. It derives its name from the Malay language, where duyung means "lady of the sea" or "mermaid". Occasionally they feed on algae and crab. Dugongs are more strictly marine than manatees but are related to manatees and are similar in appearance and behavior— though the dugong's tail is fluked like a whale's. Both are related to the elephant. Ecology: . Dugongs are are mostly herbivourous and graze on underwater grasses day and night, rooting for them with their bristled, sensitive snouts and chomping them with their rough lips but sometimes they feed on crabs. Dugongs spend much of their time alone or in pairs, though they are sometimes seen gathered in large herds of a hundred animals. The lifespan in the wild is 70 years but most die younger than this. They can be 2.4 to 3 m in size and weigh 231 to 499 kg. Female dugongs have one calf after a yearlong pregnancy, and the mother helps her young reach the surface and take its first breath. A young dugong remains close to its mother for about 18 months, sometimes catching a ride on her broad back. Interesting facts: These mammals can stay underwater for six minutes before surfacing. They sometimes breathe by "standing" on their tail with their heads above water. Status: These languid animals make an easy target for coastal hunters, and they were long sought for their meat, oil, skin, bones, and teeth. Dugongs are now legally protected throughout their range, but their populations are still in a tenuous state with estimates being there are only 1000 to 2,000 remaining in the world with many areas where numbers have all but disappeared . "The dugong is an indicator for the health of the environment and It is a clear signal that the living conditions are changing and that other products of the sea are decreasing." There is a worldwide movement to create dugong sanctuaries and for a reduction in the amount of pollutants that destroy the sea grass the animals eat.. Any harm done on the dugong is now punishable by law. 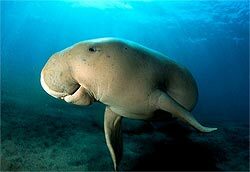 However the dugong population is not showing any increased population numbers.